This photograph was taken at East Beach in the village of Belle Terre just outside the incorporated village of Port Jefferson on Suffolk County’s north shore. I love the large multi-colored rocks of the seawall which made a perfect spot to capture this intimate, romantic moment. The beach is located just a one minute drive from Lombardi’s on the Sound at The Port Jefferson Country Club at Harbor Hills. I have been affiliated with the Lombardi family for two decades and work regularly at all three of their venues: Lombardi’s on the Sound, Lombardi’s on the Bay in Patchogue, New York and Villa Lombardi’s in Holbrook, NY. This bride and groom took all of their formal wedding photographs prior to their waterfront marriage ceremony overlooking the Long Island Sound. 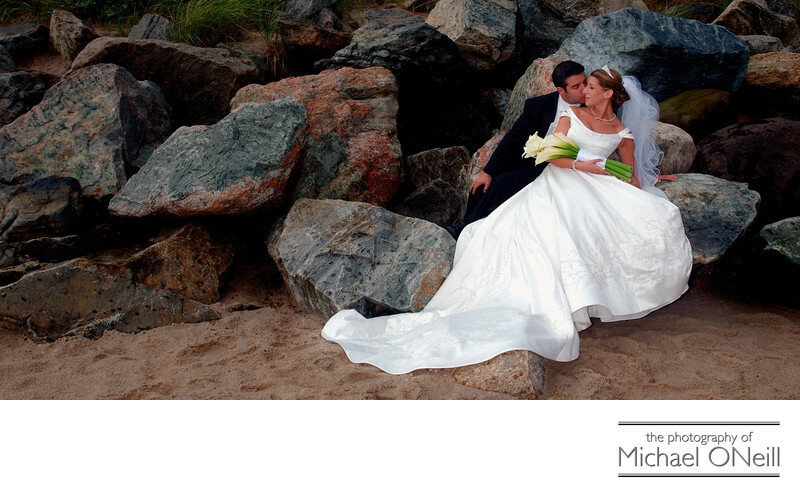 This spot at East Beach is just one of many places where we had fun taking pictures on their wedding day. If you are looking for a photographer who has experience working at all of the Lombardi’s catering venues, or if you are just looking for a photographer who wants to have fun with you on your wedding day, while creating wonderful memories for you, give me a call at my East Northport, NY studio and gallery.